Every year since my children were little, my mother brings them each a chocolate Advent calendar on December 1st. My mother, as you may know from previous posts, is from Germany, and the Adventskalender is a German invention. As early as the beginning of the 19th century, Germans would count down the 24 days leading up to Christmas, usually just with tick marks on the ground or on the wall. A man named Gerhard Lang is credited with printing the first color Advent calendar with 24 little pictures in Munich in 1908. Several years later he created the calendar with 24 little doors, or flaps. Behind each door was a Christmas scene or motif. Chocolate Advent calendars came much, much later, of course, as Christmas became more commercialized, but generally the calendars are one way to get children involved in the spirit of Advent. Two of the world's largest Advent calendars can be found in Germany, both in the façades of their cute little towns' city hall buildings. 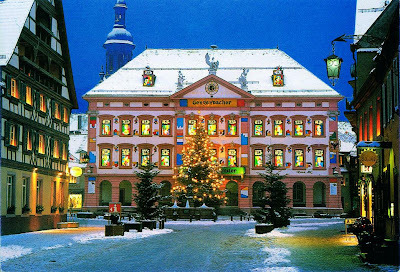 The first is in Gengenbach, on the edge of the Black Forest, where the rectangular Rathaus (city hall) happens to have exactly 24 windows (two rows of 11 plus 2 in the roof). A Christmas scene is painted in each window and unveiled one by one as Advent progresses. Rathaus, or city hall, in Gengenbach. A second beautiful, larger-than-life Advent calendar is in the town of Hünfeld near Fulda, just about smack dab in the center of Germany. 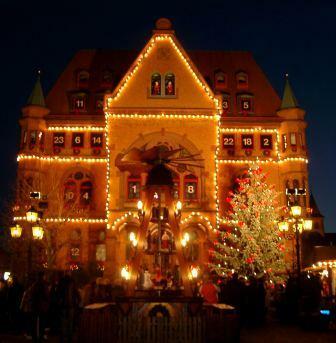 The charming, turreted little Rathaus also has just enough front windows to accommodate 24 unique Christmas scenes that are revealed one by one at night throughout the season of Advent. I think the Advent calendar may be my children's favourite part of Christmas - I love finding out the history behind the tradition. Those buildings that have turned their facades into calendars are beautiful - I would love to see them in person. That's really one of the coolest things ever. Those buildings look amazing. I really like the one with the numbers in the windows...that's fantastic. Thanks for the look. Fascinating tale my friend and I love the pics of the world's largest, especially the one of Rathaus in Hünfeld. Incredible! I am so glad that home of the Advent calendars goes to such a festive length to keep the traditions alive! Great post and pics! I think we are using the same 2 chocolate advent calendars this year-- it has to be chocolate and on December 1. I have a German mother too and that is just what you do (in addition to the stollen and gluhwein- both mandatory on Christmas). Looks fantastic! My son would absolutely love it. Thanks for the history lesson. I've never seen the advent calendar in Germany, but I saw an advent calendar at the Rathaus in Vienna last year.